Lewis Hamilton answered his critics and got his title campaign back on track with a superb British Grand Prix win. The McLaren driver mastered tricky conditions, and his team made the right tactical calls as all his main title rivals had a day to forget. Hamilton is now tied on points at the top of the championship with Ferrari drivers Kimi Raikkonen and Felipe Massa who finished fourth and 13th. Nick Heidfeld took second for BMW ahead of Rubens Barrichello's Honda. Hamilton's victory was possibly the best race of his short career and it was a much-needed fillip after he had failed to score points in the previous two races. The Englishman had been under pressure heading to Silverstone and looked to be feeling it when he made mistakes on his qualifying laps to end up only fourth on the grid. But the rain gave him a chance to showcase his superlative natural talent and he grabbed it with both hands making him the first Englishman to win the British Grand Prix since Jonny Herbert in 1995, and the first Briton since David Coulthard in 2000. Hamilton made a superb start from the second row almost passing team-mate Heikki Kovalainen on the first corner but he bid his time in second place to take the lead on lap five. He quickly pulled out an advantage, but was soon back under pressure from Raikkonen, who passed Kovalainen when the McLaren spun on lap 10 and began to eat into Hamilton's lead. The decisive moment of the race came on lap 21, when Hamilton and Raikkonen came in for their first fuel and tyre stops. McLaren changed Hamilton's intermediate wet-weather tyres for fresh ones, while Ferrari - gambling it would stay dry - left Raikkonen's used set on. Within a lap, though, it had started to rain again, and Raikkonen suddenly started struggling with a catastrophic lack of grip. Hamilton, knowing he could effectively win the race there and then, piled on the pressure, and by lap 26 was 21.8 seconds ahead of Raikkonen, who then lost his second place to Kovalainen. Already, it was clear that Hamilton pretty much had the race under control. The weather remained difficult to predict, though, and McLaren had another tough call to make when Hamilton came in for his second pit stop on lap 38, with the rain beginning to come down much harder. They fitted Hamilton with a new set of intermediates - even though conditions were bad enough for Honda to call both its drivers in and fit them with "extreme" wets in what would turn out to be a successful attempt to conjure an unexpected good result. The conditions were treacherous - a number of drivers spun off at this stage of the race, including Jenson Button's Honda - but Hamilton continued on his serene way, by now almost a minute ahead of Heidfeld. "It was so extreme out there, probably as extreme in some cases as Fuji last year," Hamilton said. "Obviously there wasn't as much rain. I was having big problems with my visor, I couldn't see a thing, especially the right side. I was having to lift my visor up and clean it every lap, especially when it was starting to rain." The German came under pressure from Barrichello's Honda, which was the fastest car on the soaking track thanks to its tyres. The Brazilian passed Heidfeld for second place on lap 43, but he was forced to pit again on lap 46 because a refuelling problem at his second stop meant that the team had not been able to fill his car up with enough fuel. Heidfeld, driving a smooth and error-free race, was now out of touch in second, but Barrichello rejoined in third, a position he held to the end of the race, and tribute to his renowned wet-weather skills. Barrichello said it was his decision to fit the extreme tyres. "There was a moment when I almost hit the wall at Club that I decided on the extreme," he said, "because I thought it might be only five laps but in those five laps you can make 10 seconds on people and that's what happened, isn't it? Raikkonen, who spun twice during the race, recovered in the closing laps to take fourth place, winning a thrilling wheel-to-wheel battle with Alonso. The Spaniard also lost out in an equally robust battle with Kovalainen, who grabbed fifth place from the Renault with two laps to go. Toyota's Jarno Trulli took seventh place from Williams driver Kazuki Nakajima by passing him on the last lap. 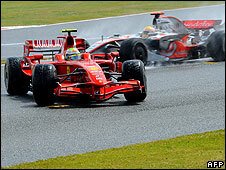 Massa had his worst race of the season, spinning five times on his way to a position as last of the finishers. Fastest Lap: Kimi Raikkonen, 1:32.150, lap 18.